Sonokinetic have been carving out a niche for themselves in phrase-based orchestral libraries, and with their latest offering, Maximo, that niche just got a whole lot bigger! Maximo is a Kontakt library dedicated to high-octane, hefty, ‘action packed’ orchestral phrases. It was recorded in the same hall, with the same mic arrays, as many other Sonokinetic libraries, but this one apparently uses the biggest orchestra of them all, with no fewer than 101 players involved in total. All sections are purposely bass-heavy, with 16 cellos in the strings, for example, and elsewhere a contra-bassoon, bass clarinet, eight horns, six bass trombones, a tuba and a cimbasso (no, I hadn’t heard of that one either...). Even the trumpets are specifically listed as ‘low’. So the fundamental character here is rather serious and butch, and if it’s glittering, effervescent heights you’re after, you’ll want to check out something like Capriccio, one of Maximo’s sister libraries. 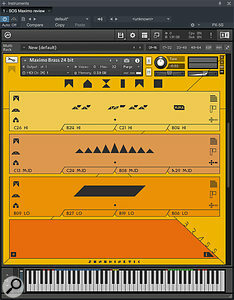 Maximo’s Brass instrument, running in an instance of Kontakt. The three graphic-score phrase areas are easily spotted, and Kontakt’s keyboard reveals the extensive (and widely spaced) key group implementation. It’s possible to load other orchestral sections alongside, in the same Kontakt instance; their key groups complement one another to allow for concurrent use. Some practicalities first. 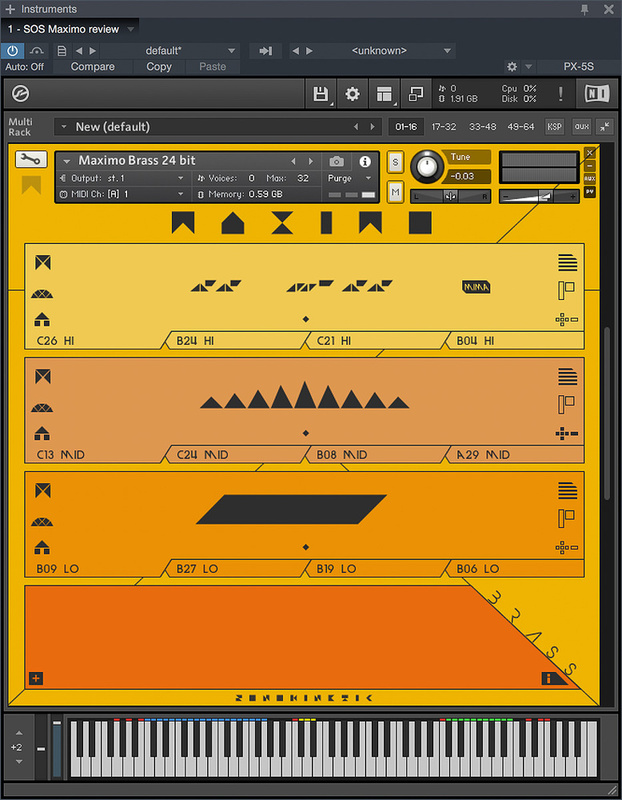 Kontakt or Kontakt Player 5.1 (or later) is required to run Maximo. It also comes in a version that will do the ‘rainbow keys’ thing with Native Instruments’ S-series keyboard controllers, and which is fully supported by the Komplete Kontrol plug-in interface. A full installation, which takes place using a dedicated downloader application, runs to 54GB, but it’s possible to install either a 16- or 24-bit-only version of the samples, which take up 18 and 36 GB respectively. Solid-state drives with fast data connections help a lot with this kind of library, especially if you plan on using the 24-bit samples. Loading a Maximo instrument into Kontakt reveals an interface so alien and eccentric that you might be forgiven for thinking you’d suddenly been teleported to the controls of a Borg cube (thinks: that might be quite fun...). Various buttons and shapes reveal little about what their function could be. Meanwhile, Kontakt’s keyboard display hints at a sophisticated keygroup implementation which, it has to be said, works better on an 88-note controller than one with fewer notes — something to bear in mind. In actual fact, the interface is easily learnt, but you probably will need to refer to the PDF documentation or tutorial videos (which are notably concise and helpful) that end up on your hard drive as part of the installation, particularly if you’re new to the Sonokinetic experience. To summarise it here, though, the interface (and indeed the whole idea of the instrument) revolves around three sample layers (the top three main horizontal sections) which can be loaded with pre-recorded phrases specific to an individual orchestral section. Each phrase is represented by a graphic score that suggests what the phrase will sound like without getting bogged down in conventional musical notation. And clicking on one of these graphics opens up a Phrase Picker panel that reveals Maximo’s entire repertoire, categorised into Low, Mid and High (pitch) phrases. Little speaker icons in the picker let you audition phrases before clicking on them to load them. At this point, it’s easy to get a sound out of Maximo. You play major or minor chords in the blue key range, and potentially all three loaded phrases go into action, in the right key, and tempo-sync’ed to your DAW courtesy of Kontakt’s Time Machine Pro time-stretching. You can switch to other phrases in real time too — notes in the yellow key range choose one the four tabs visible at the bottom of each phrase/graphic area. Essentially, using these tabs, four different phrase combos can be preconfigured, and they’ll segue one to another even in mid-phrase if you ask them to. That ensures you don’t need multiple Maximo instances just to handle a few different musical sections in your arrangement. Finally, on releasing a chord, release samples are, by default, triggered for each phrase, ensuring a crisp and neat transition back to silence. Exploring Maximo’s phrase provision is done using a Phrase Picker overlay, which has separate tabs for High, Mid and Low pitch sounds. Any phrase can be auditioned here by clicking its little speaker button.What of the other hieroglyphs? That’s best explained with the annotated screen grab, but suffice it to say there are facilities (on the left-hand side of each phrase area) for muting the phrase, controlling its volume with your modulation wheel, and configuring playback synchronisation at extreme tempos. And then, on the right, there’s a musical score of the phrase, and controls for purging Kontakt’s memory and engaging a Harmonic Shift feature, whereby a phrase can be transposed separately from its counterparts, in real time, by playing notes in the green key range. Once you know this much you’re almost entirely up to speed with Maximo, except for another tranche of parameters revealed by the ‘+’ button in the apparently empty lower panel of the interface. This overlays faders, handles and buttons (all freakily non-standard in appearance) on the various sections of the interface, and controls the likes of phrase volume, pan and timing offsets (from minor adjustments to beat- or bar-length shifts). It’s also how you access the mic-mixing feature of the non-lite presets, and dig into the nerds-only configuration of Harmonic Shift. If I skate over detail here, it’s only because I crashed through the ice and into the depths once before, when I reviewed Sonokinetic’s Sotto in the SOS September 2016 issue. What is true for Sotto holds true, completely, for Maximo, including various matters relating to release-sample, sustain-pedal and MIDI programming, real-time phrase muting, the MIDI drag feature, and additional keyswitches. Only Sotto’s appearance is different — similarly quirky, but actually with all buttons and other controls in the same locations. Perhaps more important now is to describe some of the musical material on offer. The first thing to say is that it’s all basically in a 4/4 time signature, but the way the release samples and retriggering options have been implemented means it’s not hard to make most phrases work in irregular meters too. Also, for many of the sustained-style loops, meter is more of a moot point anyway. 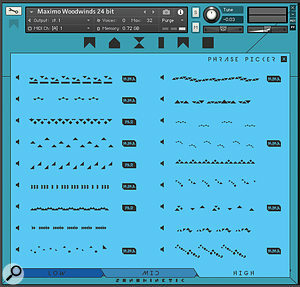 The Strings instrument immediately hints at the underlying character of Maximo. A little clutch of short, spiky, single-note unison phrases are represented in all three High, Mid and Low categories, and are designed to work together if necessary. They make ideal ‘beds’ that will create a rhythmic texture without drawing attention to themselves too much. On the other hand, there’s a bunch of ostinatos employing flattened sixths and seconds, even for major tonalities, and they’ll do double-duty for nervous, worrisome Pyscho-esque scrubbing or mischievous, zany, comic-style frolics. Sustained chords are mostly of the messa di voce (louder-then-softer) variety, and there are no indefinitely looped pad options here. Mid- and Low-group phrases, in particular, have loads of character and welly, often with plenty of characterful bow noise, and the occasional touch of syncopation and polyrhythm. Maximo’s Brass is generally more sustained, and biased more towards unison and octave textures. Great, because these can add so much grandeur and weight to an orchestral texture, with strings and woodwind dancing above. But there’s also some great-sounding held chords in the High register phrases, including a few with chromatic crunches that will be just perfect for accompanying spacecraft plunging into black holes. Dissonant ostinatos are on offer too, with grinding minor seconds, and if they aren’t Matrix enough for you I found I could also do a respectable approximation of Don Davis’ massing brass clusters by loading multiple sustained-note phrases into a couple of instances of Maximo, and spreading them out in time and pitch using the Offset and Harmonic Shift features. At the bass end of things, many of Brass’ Low-group phrases have a wonderful unbridled quality reminiscent of the mothership tubas from Close Encounters Of The Third Kind. In the Woodwinds, flutes dominate the High-group phrases, and the material here is notably more decorative and agile — again, a wise choice for typical scoring practice. By contrast, Mid is clarinet-dominated, oboes having been banished from Maximo’s band. While distinctly varied in musical style, many phrases here are surprisingly gentle and restrained, which at least provides something by way of contrast with all those bombastic brass and nagging strings. However, the Low pitch provision is once again assertive, biting, and sometimes dissonant, albeit with a couple of syrupy sustained chords thrown in to represent a more elegant mode of expression. With getting on towards 200 phrases available amongst the instruments, you might begin to glimpse how many phrase combinations are on offer, and what an enormous sampling effort it must have been on Sonokinetic’s part, recording all of them in multiple versions that work with any major and minor key. Although they’re easily learnt, and visually arresting, the roles of various phrase area buttons will be almost unguessable for the uninitiated! It’d be nice if a plain English version was available as an alternative. Quantity is one thing, but quality is quite another, and here it’s impressively high. The time-stretching approach does a grand job at all vaguely ‘normal’ tempos, and half or double speed options (engaged automatically by default) look after the extremes. Working systematically through the phrases I couldn’t find anything that wasn’t both cleanly and crisply recorded, and played with great character and precision. But at the same time Maximo’s performances are far from clinically accurate — they just sound real, and really good. That, I think, is the huge strength of this kind of library. You get results that sound like a real orchestra playing, because there was a real orchestra playing! Even the most skillfully scripted, painstakingly programmed multi-sample library will not bear scrutiny the way Maximo will. And of course, there’s almost no effort involved: you can hardly do anything that amounts to ‘programming’ here, and it’s all very intuitive and responsive. I wouldn’t doubt that some things Maximo can achieve in a minute might take several hours of fleshing out, note by note, on dozens of tracks, with a multisample library. The downside of the phrase-based approach, though, is that it’s fundamentally, rigidly, limited. Harmonic Shift helps a lot, not least in letting you create clusters or conjure up chord inversions and moving basses, but realistically you won’t be playing any of your own melodies with Maximo. Nor will you be able to even kludge together runs, glisses, or anything else specific that isn’t already in the palette of phrases provided. Orchestration purists may also find the occasional harmony change jarring — some cause big shifts in register and voicing, and smooth voice-leading goes out the window. The more layers you use, though, the less this tends to be noticeable. I’m sorry, too, that there isn’t a percussion section. A few of Maximo’s sister libraries (like Grosso) have one, and especially given the ‘action packed’ brief here, the absence of some crashes, bangs and wallops is starkly conspicuous. The ‘i’ button on all Maximo instruments calls up a graphic overlay that explains all visible buttons and interface areas. The normally empty lower panel gets this super-useful key group prompt. I know I said this in my last Sonokinetic review, but it’d be great if this could be displayed permanently. Thinking about practical usage now, I did experience some issues with Maximo’s playback reliability. Using PreSonus Studio One 3.3, which I’ve found otherwise to be a lean and reliable instrument host, an audio buffer size of less than 1024 caused the Maximo/Kontakt combo to generate CPU spikes and audible glitches, and led to non-sounding phrases. 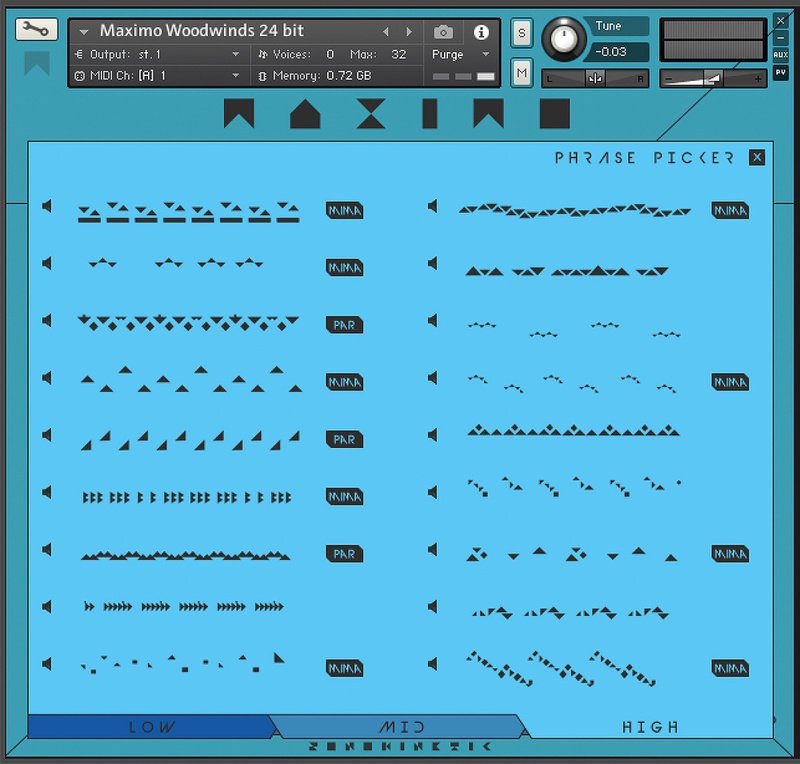 The problem was especially pronounced the more Maximo instruments were loaded into a single Kontakt instance — even with the 16-bit versions of the instruments and a single mic perspective. The problem persisted even if I took Studio One out of the equation and used Kontakt (the latest, version 5.6.5) in its stand-alone form, though at least then it seemed a 512 sample buffer was reliable. Of course, Maximo asks a lot of Kontakt, with all that parallel time-stretching. But actually it’s not generally a CPU hog: a whole orchestra’s worth of nine concurrent phrases — a colossal sound — gave me an average 12-percent hit on Kontakt’s CPU meter, and only the initial triggering of phrases caused the problems. By way of comparison, a full-bore equivalent setup of 24-bit instruments, with multi-mic mixes, gave me an average 18-percent CPU hit, but was even more liable to misbehave and required one larger buffer size again. Given that Maximo does work, at the right buffer size, it would be harsh to say it’s not work-ready. But you will have to factor that buffer behaviour into your workflow and freeze any Maximo tracks before overdubbing other live-played virtual instruments, or monitoring audio inputs through your DAW. CPU-specific concerns aside, I enjoyed testing and using Maximo immensely. Like other libraries in the Sonokinetic range, it’s a tool that answers a real need — namely, for getting fabulous results, for many scoring jobs, really fast. It doesn’t really bear comparison with a traditional multisampled library, but my goodness what an ally it makes for one, giving composers and arrangers a real best-of-both-worlds experience. At the same time it’s inspiring, and not just for cinematic genres — many phrases will work really well in pop arrangements. If you want big, driving, energetic orchestral textures, and you want them fast, there’s little to touch Maximo. Expect to hear it on a Hollywood epic sometime soon. All of Maximo’s 16- and 24-bit Kontakt instruments/patches have ‘lite’ counterparts that appear in Kontakt’s browser panel. They are equally fully featured, but instead of a user-configurable mic-mixing system they offer just a single multi-mic mix. While it would seem their intention is to be resource-light, they don’t seem to offer any advantage in CPU use. Nor do they appear to have any impact on RAM requirements compared to when only a single-mic perspective is enabled in a non-lite instrument. So they’re not quite the problem solvers they might at first seem, although they do offer a slightly different sound. Great orchestral captures that sound good across a range of tempos. Astounding ease and speed of use. Identical workflow to other Sonokinetic phrase libraries. Several features mitigate limitations of the phrase-based approach. MIDI drag lets you layer up or modify Maximo phrases using other instruments. Strictly limited in scope, beyond the provided ‘vocabulary’ of phrases. Requires large DAW or Kontakt buffer sizes for glitch-free playback. Some aspects of the graphical interface border on the incomprehensible. An action-packed orchestral sample library that’s capable of results ranging from zesty to thunderous. The phrase-based approach, simultaneously empowering and limiting, is hard not to like, and easy to have fun with. Apple iMac Retina 5K 3.3GHz Intel Core i5, 16GB RAM, OS 10.12.2.